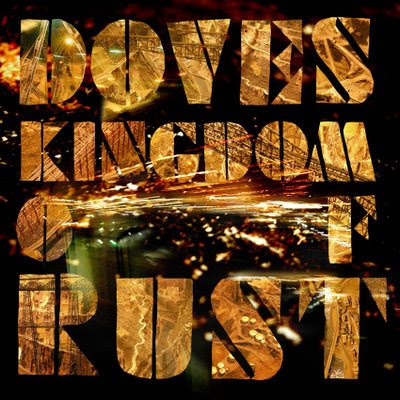 It's been four long years since Doves graced us with Some Cities, but Kingdom of Rust is the kind of album that almost makes that interminable wait seem worthwhile. Where as previous efforts found Doves rooting themselves predominantly in their own unique brand of British arena rock, the majority of Kingdom of Rust plays out as a slightly disjointed mix of songs that take the band to several new musical territories. However, where Kingdom lacks the cohesion of past Doves records, it makes up for this slight downfall with the masterful execution of some of the more disparate tracks. One such success is "Jetstream", the group's self-professed homage to the soundtrack of Blade Runner. The resulting song is a pretty spot-on representation of what I imagine a Vangelis-penned rock song would sound like. Another triumph is the western-tinged title track which finds Jimi Goodwin in fine vocal form, atop one of the catchier riffs the band has produced in recent memory. Finally, Goodwin tosses the mic to drummer Andy Williams for "Compulsion", a track with a dance beat and disco-esque bass line that echos the trio's work under the name Sub Sub. As far as more traditional Doves fare goes, there's plenty here that stands shoulder to shoulder with their previous work. "House of Mirrors" reminds me of one the band's other highly percussive track, "Pounding" from Last Broadcast, but ultimately stands on its own thanks some great keyboard embellishments care of the 'fourth Dove'; Martin Rebelski. "Greatest Denier" is one of the better ballads the group has ever done, and definitely one of my favorite tracks on the record. Closing track "Lifelines" finds Goodwin crooning about a "...place I've never been" as the band slowly swells behind him, with the help of a choir. It's a triumphant yet melancholy song that seems to echo the tribulations behind the making of this album. It's been a long time coming, and I don't think it's entirely what anyone expected it was going to be; perhaps even to the band themselves. However, with Kingdom of Rust Doves once again turn in a record that is something more than the sum of its parts; a record that exudes scope, emotion, and majesty.